Having the right core infrastructure is paramount to the success of your business. Reliably and predictably connecting applications to employees and customers is the cornerstone of your business and Lanworks understands this. Let Lanworks assist with best-practice-based network solutions: infrastructure design and implementation that enables your current and future business growth. Ensure dependability and network resilience for your business with a high-performing network core that will scale, self-heal, notify for help and protect your users and applications from threats. Lanworks provides network solutions using only tier-one hardware and software to architect a right-sized best-practice-based core and edge regardless if on-premise, private cloud, public cloud or hybrid. 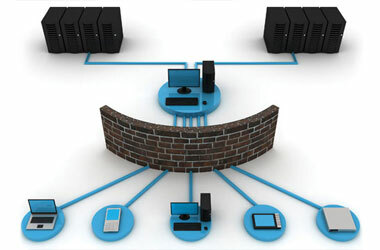 Your network is full of applications you cannot identify nor control with your port-based firewall. File sharing, social networking, personal email, and streaming media are just a few of the applications that can evade your firewall and your employees are using these applications — legitimately in many cases — to do their jobs. Blocking the applications outright may hurt your bottom-line, but blindly allowing them invites business and security risks. Let Lanworks guide you through a next-generation firewall deployment that will strike the right balance between blocking all personal-use applications and allowing all of them. Secure application enablement begins with knowing exactly which applications are being used and by whom. Armed with a better understanding of what is traversing your network, your security team and business groups can determine the business value of certain applications to specific users. More and more employees are demanding access to company resources via wifi devices and smartphones, making more robust wireless connectivity solutions a must-have in any organization. Lanworks enterprise wireless solutions keep users securely and reliably connected with flexible options for guest access all while protecting your corporate assets. Users want quick, uninterrupted access to applications that work well and meet all their needs, wherever they are, on whatever device they happen to be using. Apps need to load quickly and perform without a hitch – otherwise, users and customers will look elsewhere. Let Lanworks help with your navigation of application acceleration products and functionality ensuring your content is delivered with reliability, security and resiliency. Need to create a development environment that’s completely isolated from production? Need to bring up this environment in a few hours? Lanworks agile SDN solution creates scalable virtual networks that leverages public or private cloud allowing you to offer new services, increase business agility and grow revenue. Open architecture operates with wide range of hypervisors, orchestration systems and physical networks, and won’t lock you in with a specific vendor, cutting down significantly on expense.